The Brewshed Alliance just announced that it is re-releasing its popular Alpine Lakes Pale, brewed by Elliott Bay Brewing. The beer was originally brewed to celebrate the passage of the Alpine Lakes Wilderness Additions, which passed in late 2014 (read our original story). Now it’s coming back by popular demand and the organization has planned two parties to mark the occasion. Also, Brewshed Alliance has planned a tap takeover at Naked City Brewery and Taphouse featuring beers from a number of its Brewshed partner breweries. Details about both events are below. The Alpine Lakes Pale charity beer by Elliott Bay Brewing Company will be released on July 7th and poured during the July 16th Brewshed® Tap Take Over and Washer’s Tournament at Naked City Brewery and Taproom in Greenwood. 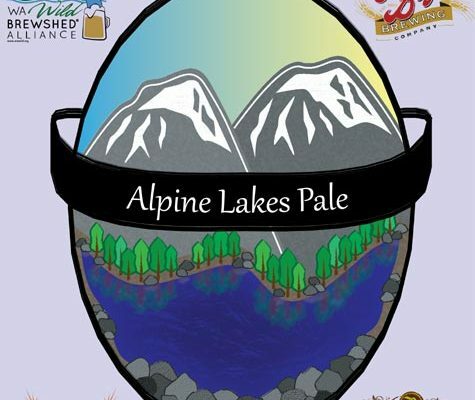 The Alpine Lakes Pale by Elliott Bay Brewing Company’s James Goodman is coming back! This delicious beer was originally brewed in early 2015 in honor of the passage of the Alpine Lakes Wilderness Additions in December the previous year. Conservation folks and beer drinkers alike rejoiced at the opportunity to drink a delicious a beer, an opportunity to literally drink success. The Alpine Lakes Pale is a charity beer – a beer that will help continue to support Washington’s Wilderness Legacy by celebrating the accomplishments we have already achieved. Hops Direct and Country Malt Group both donated raw product and Elliott Bay Brewing Company is passing along the financial impact of that donation with $1 per beer purchased from the ENTIRE BATCH! So join us for the release party and try this great beer! In honor of Elliott Bay Brewing Company’s generosity we are also reviving our Alpine Lakes Pale Brewshed Supporter Challenge, but with a new twist! For every pint’s worth ($5) you donate your name will be entered to win 3 AWESOME prizes, including a full mixed case of Icicle Brewing Company bottles! Help us reach our $3,000 goal by donating today online or joining us during Brewshed events through August! During the event we will have drawings, opportunities to enter the Alpine Lakes Pale Challenge, the delicious beer (of course!) and so much more! Come out and drink a beer celebrating the permanent protection of Washington’s Wilderness Legacy with the Alpine Lakes Pale! If you can’t make it out to the release party you will be able to find it on tap during our July 16th Brewshed Tap Take Over & Washer’s Tournament at Naked City Brewery and Taphouse in Greenwood. Sixteen different Brewshed Partners will be on tap and for every Brewshed Partner beer poured $2 (one from Naked City and one from the participating partner) will be donated to Washington Wild in support of the Brewshed Alliance! Tap Take Over is Free and runs ALL DAY! Come out and drink some Brewshed Partner beer in support of Washington Wild’s statewide conservation work! The Washer’s tournament requires registration and a donation registration fee of $20 ($10 per person on a two person team). All registration proceeds benefit Washington Wild and our conservation work to keep our state wild, green and full of great beer! Limited spaces are available for the washer’s tournament, so be sure to register early! Ticketing website: washers2016.bpt.me. Next Post:Maritime Pacific Brewing introduces a new IPA, the next in the Regatta Series. Yall are doing some great work. Introducing people to craft beer and advocating wilderness preservation is awesome.